NOTE: Verify that mDNS and WSD are enabled on the Sharp MFPs via the web interface. What is the latest version of firmware for the xPrintServer? The current released version of firmware for all xPrintServer Editions is 3.2.0-2. Note: To upgrade an xPrintServer to from 1.x or 2.x firmware to 3.x firmware you must use the free xPrintServer app on an iPhone, iPad or iPod Touch. Release Notes ftp http Right-click and choose "Save Target As..."
The release notes apply to the current xPrintServer firmware for all models. If you would like to be notified when new firmware is available, click the "Notify Me" button at the bottom-right corner of this page. Note: To manage the xPrintServer, see Communicating with an xPrintServer from a browser below. Communicating with an xPrintServer from a browser. Note: This will only work when Bonjour is installed. 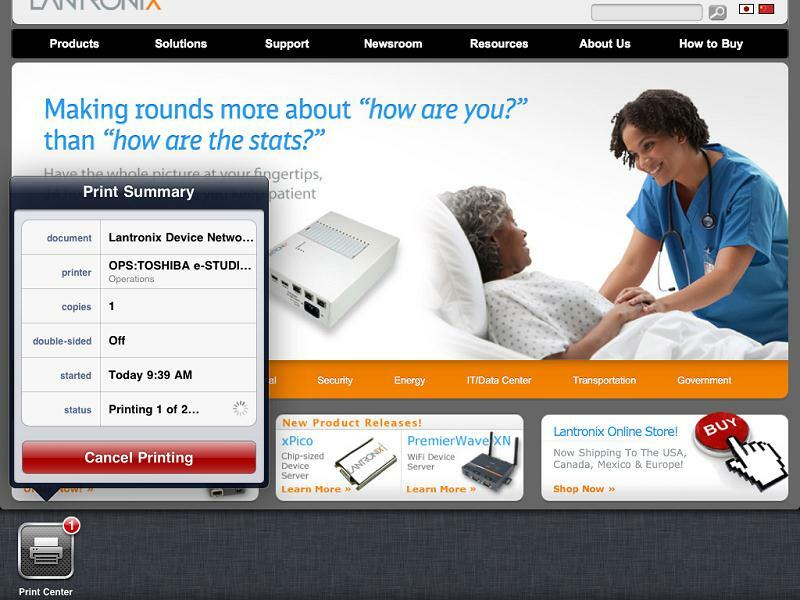 Open http://www.lantronix.com/findmyxprintserver to find your xPrintServer's IP address on your local subnet. Be ready with your xPrintServer's serial number with no colons or dashes and upper case letters, e.g. 0080A3123ABC. If you are not automatically re-directed to the xPrintServer's web page, type the resulting IP address into your browser's address field to browse to the xPrintServer's WebManager. Another option is to open http://ltrxips1.appspot.com to be redirected automatically to your xPrintServer's webpage after providing your xPrintServer's serial number as above. This tool will recognize the serial number with or without colons, in upper or lower case. Note: If you are running iOS7 on your mobile devices, you will need to install the latest firmware (4.0.0-35). See PDF below for instructions. What is a Lantronix xPrintServer? The xPrintServer™ is a patent-pending AirPrint® print server which provides wireless printing capabilities for iPad®, iPhone® and other devices with iOS®-enabled AirPrint applications. Simply plug an xPrintServer to a wired network with WIFI local subnet access and all network-connected printers are auto-discovered and made available to any iOS AirPrint-enabled application on your iOS device. Note: Print jobs process one at a time regardless of the number of configured printers. Note: Supported printers should be directly attached to the network (wired or wirelessly). 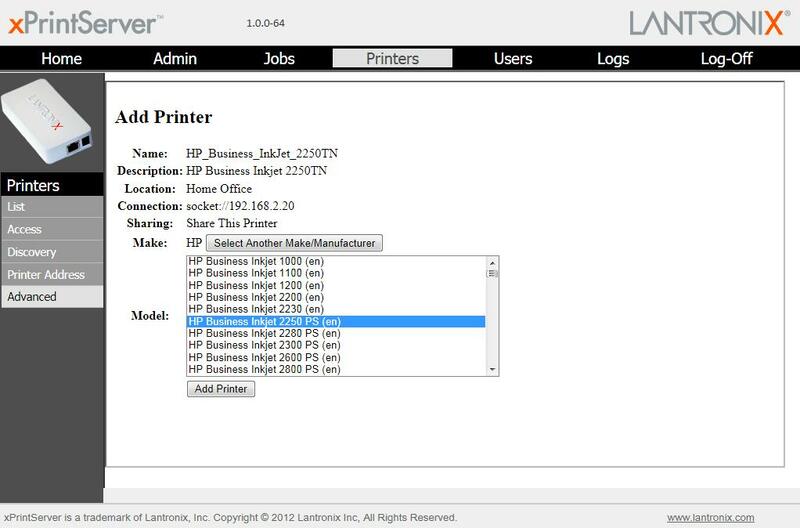 See http://www.lantronix.com/it-management/mobile-print-servers/supported-printer-list.html for the latest list of all supported printers. This list is periodically updated with new printers. xPrintServer supports DHCP-assigned IP Addresses. The following items are configured via DHCP. What is a wireless print server? What is the xPrintServer™? A “print server” is a network appliance / hardware device that enables a printer to be installed in the network. 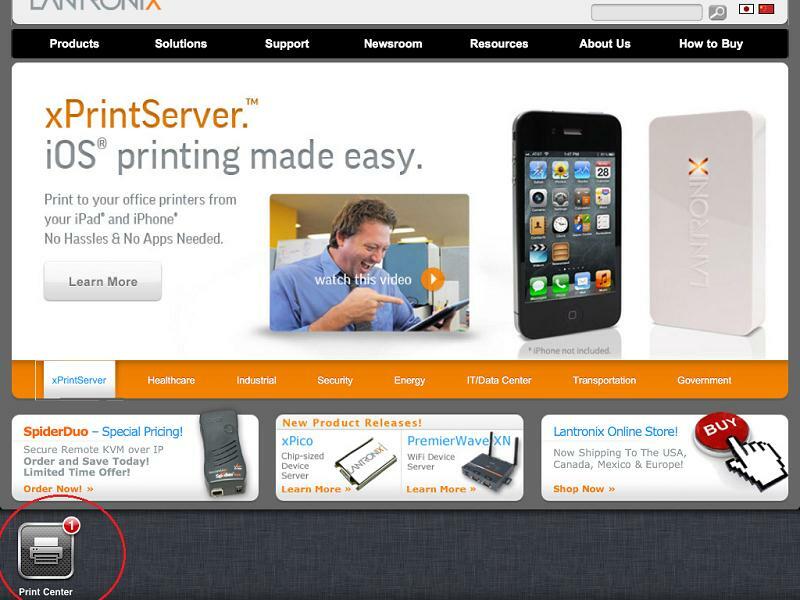 The xPrintServer from Lantronix is a print server dedicated to supporting printing from Apple® / iOS® devices, such as an iPhone®, iPad®, iPad2, or iPod®. How many xPrintServers do I need? For optimal performance, we recommend one (1) xPrintServer for every 10 printers on each subnet. Is there a limit to the size of documents xPrintServer can handle? No, there is no limit to the number or size of documents. However, as with all printers, the larger the size of the document, file or image, the longer it will take to print. The xPrintServer-Network Edition boasts up to 66 pages per minute (faster than most legacy printers require). Will the xPrintServer work with USB* (non-networked) printers? No. At this time the xPrintServer only works with "native network printers." "Native network printers" are printers which have built in Ethernet or wireless connection. USB printers, (attached or shared,) currently are not supported by the xPrintServer. * A USB network attached printer is a printer that connects into a network printservering device. Some examples being: Apple Airport, an Access point, Switch, Router or USB-to-Ethernet adapters that would give the USB printer a network connection. *Shared USB printers are connected printers attached from the USB connection directly to a computer USB port. The computer presents or shares that printer to the network from the computers Ethernet connection. Where do I connect the xPrintServer? Does it need to be located near the printers or the users? 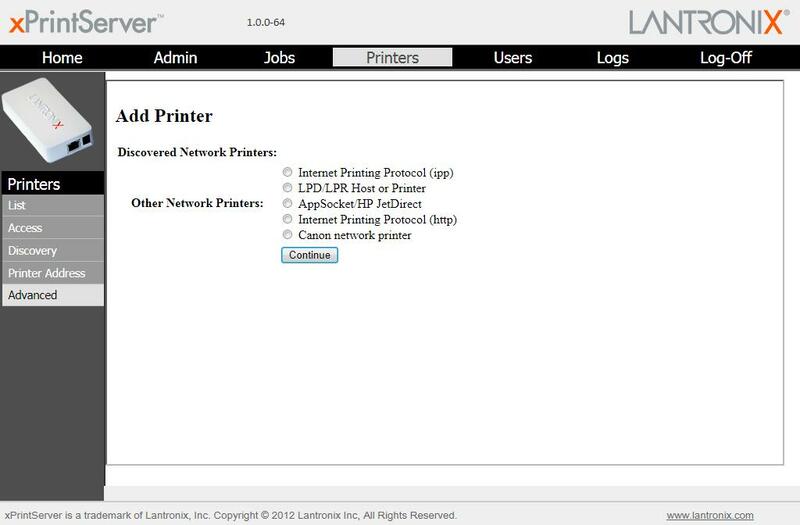 No, the xPrintServer can be connected anywhere on your LAN (on the subnet on which your printers are located). Simply use the RJ45 cable and plug it directly into the LAN, router, etc. Your iOS device users should then connect to your corporate WiFi network – at which point the xPrintServer will auto discover and auto populate your available printer list on the iOS device. Will the xPrintServer change or negatively impact my current network or printer settings? No. The xPrintServer will not change or impact any of your existing settings or printers. Users can continue to use printers as they normally do – now they can enjoy the added benefit of printing from their mobile devices. How do I find my xPrintServer IP Address and Initial Login? Enter the default login information. How can I reset xPrintServer to factory default? You can reset the xPrintServer to factory default settings – this is available via a “pin hole” in the underside case of the device. To reset the unit, (1) Place the end of a paperclip or similar object into the reset opening (pin sized hole at the bottom of the device) – press and hold for ten (10) seconds; (2) remove the paperclip to release the button. The firmware restores the factory settings to the original configuration and reboots the unit. How many pages per minute can the xPrintServer support? The xPrintServer-Network Edition boasts up to 66 pages per minute (faster than most legacy printers require). What is the “range” of the xPrintServer? This is a common misconception – the xPrintServer connects via WIRE to your network. The range is dependent upon your wireless network, not the xPrintServer. Will there be any firmware updates to xPrintServer? Yes, the company will periodically provide both general maintenance updates as well as updates to support additional printer / print drivers. How do I retrieve updates to xPrintServer? Step 3: You will be prompted for a username and password. I removed the power from my xPrintServer and immediately reconnected the power, and now the X logo is blinking dimly and the xPrintServer is rebooting continuously. How do I resolve this? If power is re-applied too quickly to an xPrintServer, it can go into a ‘boot loop.” To resolve the problem, whenever you remove power from the xPrintServer, please wait at least five seconds before re-connecting the power. What if I have printers on different subnets? How can I configure the xPrintServer to communicate with printers on different IP subnets? The xPrintServer will auto-detect and auto-provision all printers on the same subnet. If you have printers on different subnets, you will need to follow these instructions: First, check that your routers and Access Points are not blocking multicast traffic to port 5353. 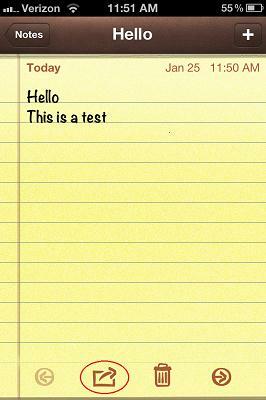 This is the Bonjour port, and if it is blocked the iOS devices will not be able to see the printers. Then manually add printers on different subnets using the Advanced option on the Printers page of the xPrintServer's web configuration manager. This completes the process. Click on the Printers List button and the printer should be displayed in the list of available printers. JetDirect interfaces always listen on 9100, but other brands of printer may use a different port. Configuration for other protocols is similar. How do you configure the xPrintServer to only share a specific printer to Apple devices? Step 2: On the menu, select "Printers"
Step 4: Click on the "Gear" icon on the far right of the printer description, and click on the Hide Printer button. After Step 4, you will notice that next to printer it will say "Not Shared". To share the printer again, just click on the "Gear" at the end of the printer and click on the Share Printer button. 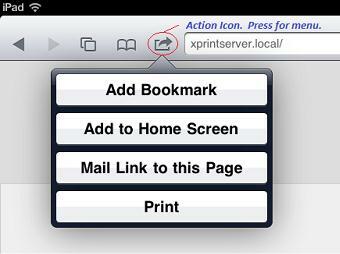 Where do I find the 'Print' command/icon to print to the xPrintServer from my iOS app? There are a multitude of free and commercial apps available for Apple iOS devices. Depending on what the apps do, a number of these are capable of printing. 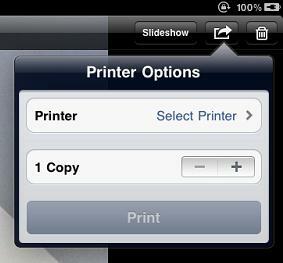 Printing from an iOS app is easy, but requires that the app is print-capable. 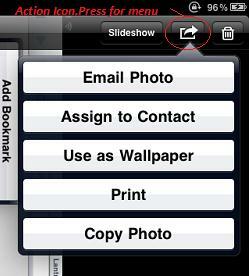 You can verify this by pressing on the 'Action' icon from within the iOS app and checking for the 'Print' option. In addition, Action icons in different iOS apps may appear differently. Press on the Action menu to show all the possible actions the app can do on the item. Select Print. In the Printer Options dialogue box, press Select Printer >. Select the desired printer from the list of available printers that are advertised by the xPrintServer. After selecting the printer, confirm the print job by pressing 'Print' in the Printer Options dialogue box that follows. That's it! Your print job will be sent to the chosen printer by the xPrintServer. Pick up your completed print job at the printer. The Apple iOS comes with a number of default apps right out of the box. Some of these apps allow you to print. Depending on the iOS version as well as the iOS app version, these apps may or may not have the special functions ('Action' icon) menu (see Fig1 below), or may or may not have the Print option available in the special functions menu. Action icons may differ in appearance in different iOS apps. In general, they appear as a curved arrow pointing left or right and may or may not have a square box surrounding the arrow. Note: Default Notes App version on iOS v4.3.5 does not have a 'Print' option in the special functions menu ('Action' icon). Default Maps App on iOS v4.3.5 does not have an available special functions menu ('Action' icon). Updated versions of these apps may provide the special functions menu or Print functionality that is missing. Consult the Apple App store for more information. In addition to the above, there is a multitude of free and commercial apps available for Apple iOS devices. Depending on what the apps do, a number of these are capable of printing. Because of the sheer number of available iOS apps, it will be impractical to maintain a list of supported xPrintServer apps. 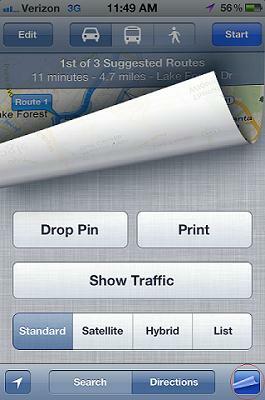 The best guideline to follow is: AirPrint-enabled iOS apps can print through the xPrintServer. You can tell this if the 'Print' function is available in the special functions ('Action' icon) menu. What is the procedure to follow to manually add a printer to the xPrintServer? In some cases, you will need to manually add a printer to the xPrintServer. Or, if you prefer control over the driver to use with your specific make and model printer, you can manually create printers in the xPrintServer. The example below uses an HP printer and the HP JetDirect socket as the transport protocol. Use this as a guide and substitute your desired make and model and transport protocol required by your printer. Note: For a full sized version of the images below, click on the image. Discovered printers may or may not be enumerated in the Discovered Network Printers list. 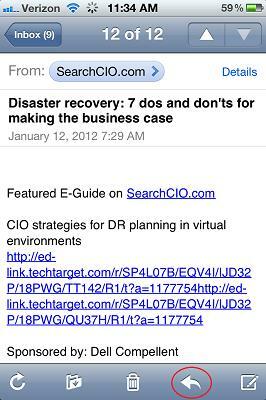 For example, there are no discovered printers displayed in the screen shot below. In the Other Network Printers section click on the radio button for AppSocket/HP JetDirect. On the next page (Add Printer), complete the URL for the Connection field. 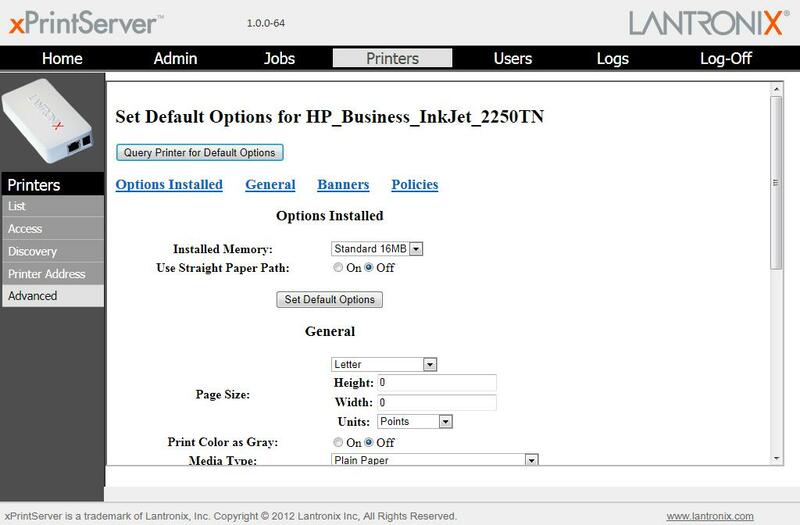 In the next Add Printer page, fill in the desired information for the Name, Description , and Location of the printer. Note that spaces are not allowed in the Name field. In the next Add Printer page, select the printer manufacturer, e.g. HP from the Make drop-down list. Wait a few moments for the list of available printer models to populate. Use the next drop-down list to select the specific model matching your printer, e.g. HP Business Inkjet 2250 PS for this example session. On the next (last) page to manually add your printer, click Set Default Options. I am unable to print through my xPrintServer even after deleting and reprovisioning my printers. What can I do on the xPrintServer to fix this? Sometimes, failure to print to the xPrintServer is not an issue with the xPrintServer itself. The first place to start troubleshooting is checking the orange 'X' LED on the face of the xPrintServer. A rapid blinking of the orange 'X' LED indicates that the device is printing. If it displays a glowing on/glowing off pattern, the xPrintServer is idle (ie, waiting for print job). If you encounter a situation where you have sent a print job from your iOS device, but nothing prints, and the xPrintServer orange 'X' LED is showing an idle state, the issue could be with your iOS device. 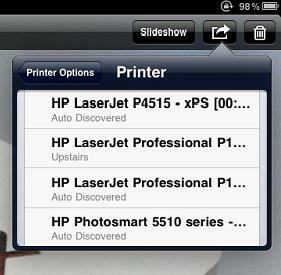 When a print job is started from a print-capable app, the iOS device starts the print spooler to manage the print job. This is a transparent process that sends the print job from the app to the printer. When a print job freezes, it remains in the print spooler until it is manually cleared. This effectively causes subsequent print jobs to wait in queue until the frozen print job is cleared. The iOS device typically shows no notification of this event, which leads you to think the issue is outside the iOS device. A quick way to check for a frozen print job is to press the home button of the iOS device twice in quick succession. This action brings up a list of the apps that are currently active and those still running in the background, similar to the Applications tab in Windows Task Manager. This feature is not available in pre-v4.x iOS versions. An example showing this is illustrated below. To delete a frozen print job from the print spooler, double-press the iOS device's 'home' button (press it twice in quick succession) to display the 'Print Center' app in the list of running apps. Touch it to bring up its details and touch 'Cancel Printing'. This will clear the frozen print job and allow the remaining print jobs to print. If power is re-applied too quickly to an xPrintServer it can go into a boot loop. To resolve the problem, whenever you remove power from the xPrintServer wait at least five seconds before re-connecting the power. Note: While the xPrintServer can support multiple printers, it processes one print job at a time. If there are large numbers of users submitting print jobs to multiple printers via the xPrintServer, it is recommended that you use one xPrintServer for every 5-7 printers. This will help assure that printing does not take an excessively long time. Why am I only seeing three drivers loaded in my xPrintServer? When the xPrintServer reports an unusually small number of loaded drivers, say 3 (or, in some cases, 4), this means that the xPrintServer is unable to connect to the cloud service to download drivers. In normal operation, the xPrintServer will show upwards of 3500 drivers loaded, reflecting the actual number of printer drivers currently available in the cloud service. This is usually accompanied by messages seen in the Printers>Discovery page in the xPrintServer's WebManager indicating that the (supposedly supported) xyz model printer has no matching drivers found. Three or four loaded drivers indicate that the xPrintServer is unable to connect to the Internet to pull needed printer drivers. This usually happens when the customer's network has some kind of network proxy setup, or firewall equipment that is filtering the types of connections allowed to/from their network to the outside. Once the xPrintServer is provided clear and unfiltered access to the Internet, then the xPrintServer is able to reach the cloud service to obtain the drivers for the supported printers that are discovered in the printer discovery process. Background: There are really only three print drivers that are pre-loaded in the xPrintServer. 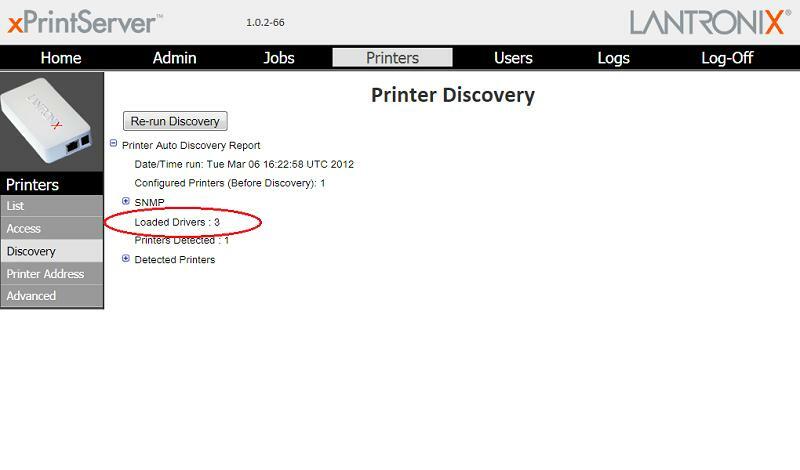 The 'drivers' that get downloaded from the cloud service are actually ppd (printer page description) files. You can think of ppd files as a set configuration settings for the printer to treat a print job. These configuration settings may include default tray, duplexing, print quality (resolution in dpi), banner, and other backend filters needed per printer. These files tend to be printer model-specific, different per model printer, so you can't usually use one printer's ppd file for another. These ppd files allow the xPrintServer to communicate a print job successfully to the correct matching attributes that specific printer models require. They are not printer 'drivers' in the strict sense of the word.